The front and back of this pillow is knitted in one continuous piece. The shaping is accomplished through short rowing. The left edge of the knitting is the center of of the back and the right edge is the center of the front. 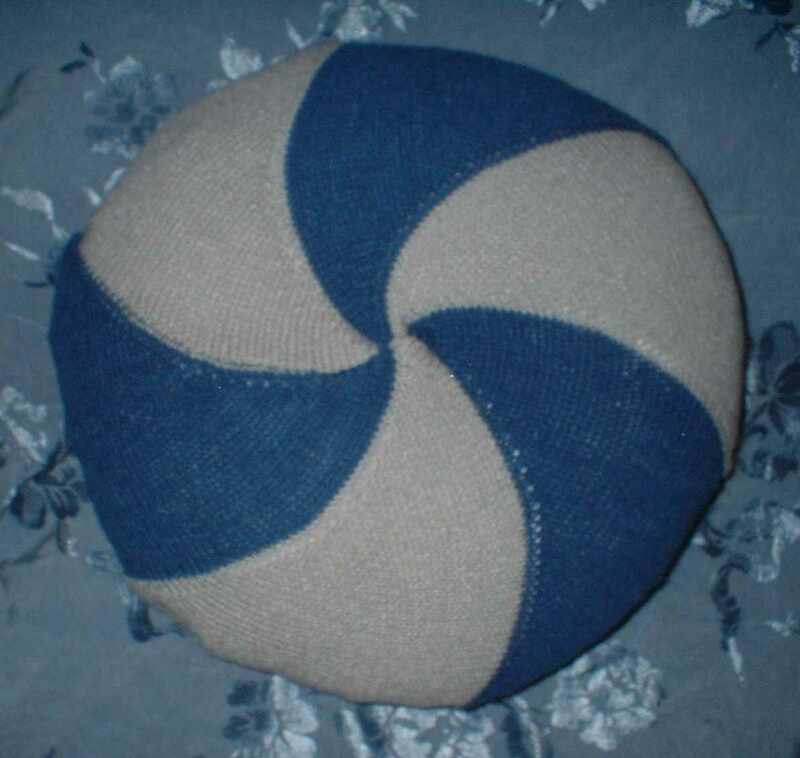 The middle of knitting forms the circumference of the pillow. 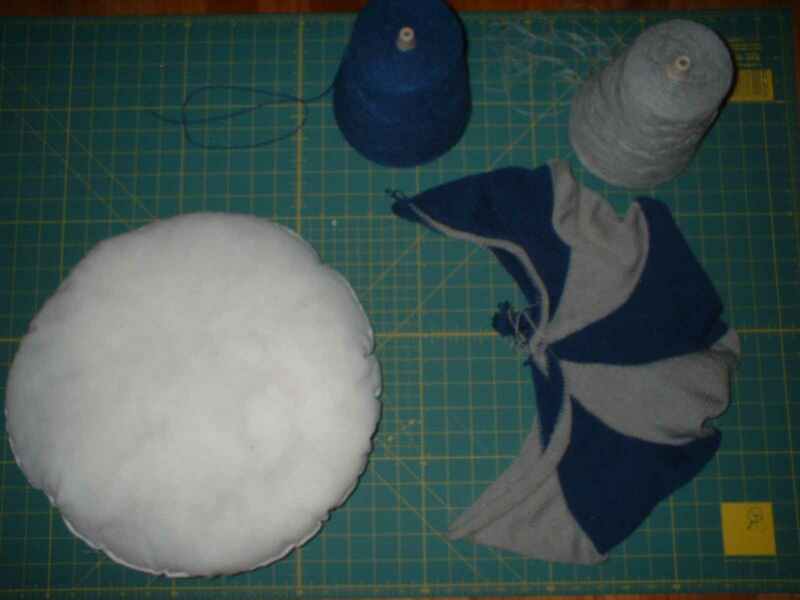 You will need a 16 inch round pillow form to complete this project. The form programme takes care of all the shaping and so this pillow is actually very easy to knit despite its complex shape. Technically this pillow is hexagonal, not round. Each wedge of the hexagon is knitted in turn with the back and front knitted simultaneously. The stitch is sockinette knitted on the front bed. Some single bed slip patterns may also be suitable The yarn I used was Tamm 3-ply knitted at stitch size 6. A similar weight yarn should give you good results. Programming the console: Use cast on 6. No stitch pattern is necessary. Knitting will continue from cast-on in sockinette. You can alternate colors to form stripes or swirls. I changed color after each wedge was knitted. When prompted, enter the form programme. 'A' is your length in millimeters for 40 rows of knitting and 'B' is your width in millimeters of 40 stitches for the yarn you are using. Gauge is critical to the outcome. Measure your swatch carefully. If you are unfamiliar with form programmes please review them in your manual. Knitting: The machine will move pushers in and out of work as necessary to accomplish the shaping. Do not transfer any stitches, just continue to knit across. Because more stitches are knitted at the center than at the edges, the knitting tends to ride up in the middle. A couple of small weights hanging on the knitting at the center will help with this problem. Be vigilent for dropped stitches. A six row selvage completes the knitting. Note: Short rowing will cause small eyelets in the knitting, which I consider decorative. If you don't want eyelets wrap the yarn on the needle adjacent to the just knitted row on each carriage pass. Making up: Wash and block to shape. I blocked mine on the pillow form. 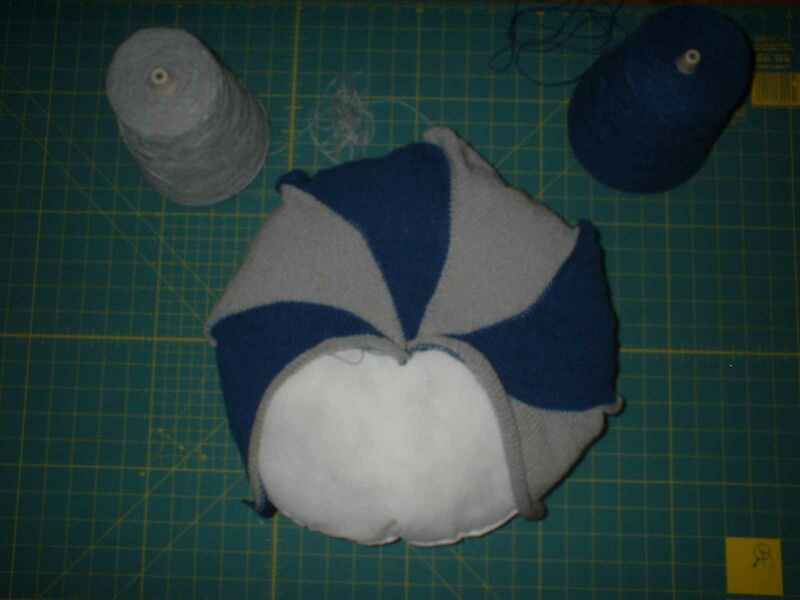 Refer to the pictures and insert the pillow form into the knitted piece. After blocking, sew from the center of the front to the center of the back along the radius.